Satyagraha and the Mysterious Power of Gandhi’s Non-violence Part 1. His statements would seem vindicated as ‘the science of non-violence’ as Gandhi often called it, was later used by Martin Luther King Junior to win civil rights for African Americans in the United States. Nelson Mandela also used it to peacefully end apartheid in South Africa. So let’s revisit the past to look at the science of non-violence and using the great man’s own words as much as possible, let’s try to see what makes it tick, so to speak. Let us also attempt to ascertain why non-violence has been so successful in the past and why Gandhi claimed it to be the vital rule of conduct for the world’s people, if we are to live consistently with human dignity and attain world peace. So let’s revisit the past to look at the science of non-violence and using the great man’s own words as much as possible, let’s try to see what makes it tick, so to speak. Let us also attempt to ascertain why non-violence has been so successful in the past and why Gandhi claimed it to be the vital rule of conduct for the world’s people, if we are to live consistently with human dignity and attain world peace. At the very core of Gandhi’s Satyagraha movement was the belief that the Universe has been created, is ordered and under the control of a supreme intelligence. That governing intelligence he saw as benevolent and has as one of its manifest attributes, equal love for all humanity. 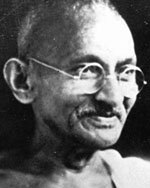 Gandhi was constantly striving throughout his life to meet his maker by realising his true nature; that of a soul: imperishable, changeless and eternal with infinite life. We’ll now let Gandhi’s own words more fully explain the incomparable use of soul force. According to Gandhi, non-violence in its purest form is a soul-force and has behind it the power of the Universe’s Creator. Next in part two we must ask what principles and laws need to be adhered to in order to produce soul-force and who is qualified to use it? Eknath Easwaran (2001), Gandhi the Man: The Story of His Transformation, 3rd edition, Nilgiri Press.